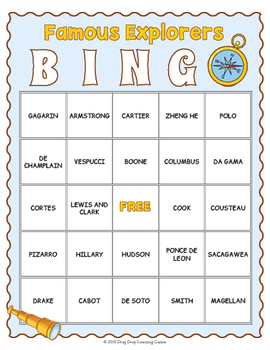 Your students will learn the names and accomplishments of 26 famous world explorers while having fun with this engaging and informative BINGO game. It makes a great introduction to the subject and a welcome fun break in the classroom. 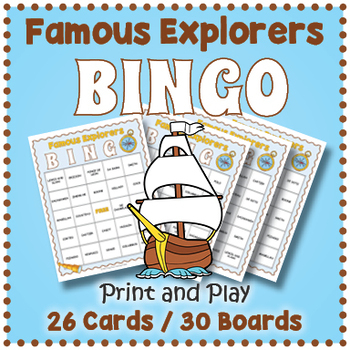 Included are 26 calling cards and 30 unique bingo game boards. 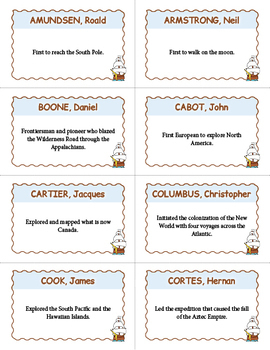 Each calling card has the name of the explorer and what he is most famous for having explored. You can either call just the accomplishment of the explorer or include his name, depending on how much you wish to challenge your students. 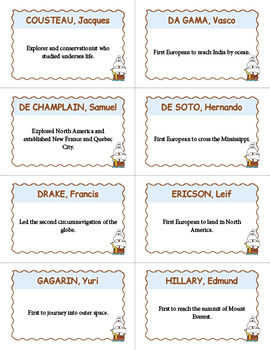 The adventurers included are: Amundsen, Armstrong, Boone, Cabot, Cartier, Columbus, Cook, Cortes, Cousteau, Da Gama, De Champlain, De Soto, Drake, Ericson, Gagarin, Hillary, Hudson, Lewis and Clark, Magellan, Pizarro, Polo, Ponce De Leon, Sacagawea, Smith, Vespucci, and Zheng He.